Many of you might be aware that Mr. Bill from Saturday night Live has his own website, and he certainly deserves it! Anyone who used to watch SNL from 1976 to 1980 will undoubtedly remember the clay figurine star known as Mr. Bill, and how he often got flat as a pancake. He got his big break when creator Walter Williams submitted a home movie of his creation to SNL during their first season. Even though he was only on the show for four years, he's a legend with his loyal fans. He is one of those characters that you'll never forget, because of his voice or maybe because of his demise that was always lurking around the corner. Remember when Mr. Bill and his dog Spot would start out innocently enough and Sluggo and Mr. Hands would appear? 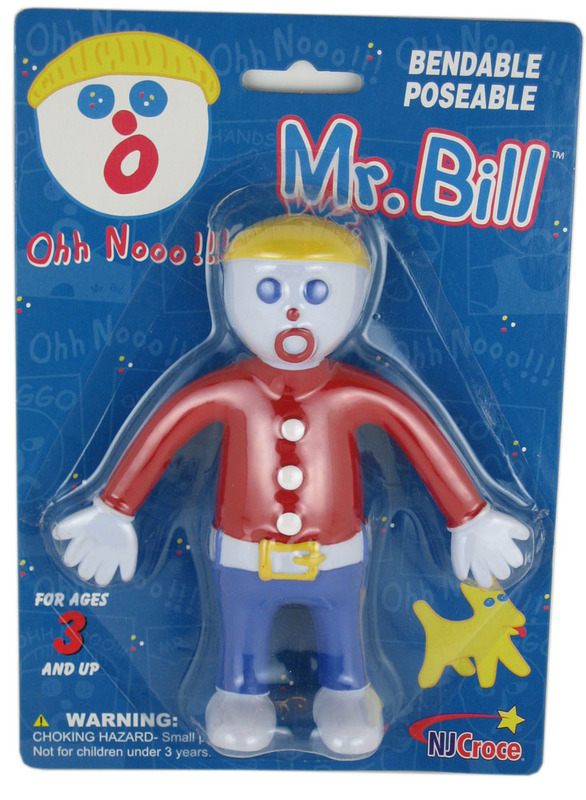 Mr. Bill is such a popular character that he appeared on other places besides Saturday Night Live. In 1981, Mr. Bill was the answer to a Password Plus Puzzle on tv. In 2008 along with Mr. Hands, Mr. Bill became a Subway spokesman. The same year he was also featured in a MasterCard commercial. In 2010, a Mr. Bill iphone game was launched. He was also featured on the tv show "Medium."